Recently Amy Lee from Daniusoft Studio contacted me regrading free version of video converter - Daniusoft Video Converter Free. Daniusoft Video Converter Free is an easy-to-use and very intuitive free video converter. Using it, you can easily convert all your video, audio and even HD video collections in batch conversion mode (5 files limited per conversion) or one-at-a-time. Daniusoft Video Converter Free can not only convert videos or HD videos to AVI, WMV, MPEG, MOV, FLV, MP4 easily and quickly, but it can also extract audio from the videos and convert them to MP3, WAV, WMA formats. With this Daniusoft Video Converter Free, you can also convert videos in YouTube compatible video format (FLV format) to share your videos on the Internet. You can convert your videos in WMV or AVI format, so that you can easily load them on Windows Movie Maker and edit them further. This free video converter also comes with a simple video editor which allows you to crop videos, trim video length, merge two or more video clips, adjust video effect, etc. * Convert any video like AVI, MP4, MPEG, 3GP, AAC, RAM, MTS, M2TS, TS, HD AVI etc. to popular video audio formats with high-speed and excellent quality. 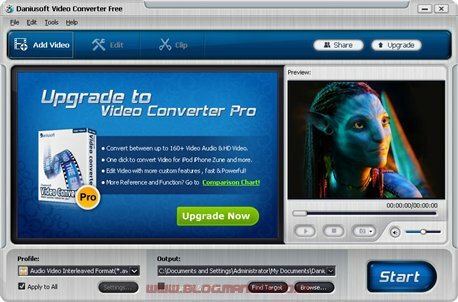 * This Free Video Conversion Software supports batch converting up to 5 files one time. * Extract audio from video to MP3, WAV, WMA with this Video Converter Free. * Clip any your favorite segments from videos and merge them into a creative one. * Crop the frame size of video to maintain the part you want only.